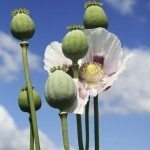 Three thousand years ago, gardeners were growing oriental poppies and their Papaver cousins around the world. Oriental poppy plants (Papaver orientale) have remained a garden favorite ever since. Once planted, they require no special care and will last for many years. 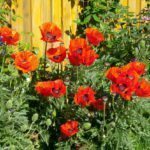 Their original vibrant red-orange color is still the most popular for growing, though oriental poppies come in a variety of colors that will match or blend any garden’s color scheme. Don’t plant them in soggy ground. They hate wet feet. Do fertilize them, but only once a year. Select a site that gets plenty of sun — at least six hours a day – and turn over the top inch or two of soil. 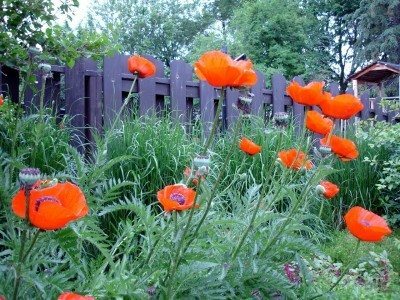 Poppies aren’t particular about their soil, but they are fussy about drainage. If the drainage is poor, amend the soil with a couple of inches of compost before you plant. Sprinkle the seeds on top of the soil. Do not cover them. Oriental poppies need light to germinate. Water the area regularly, keeping it moist but not soggy until the seeds germinate, which should take about two weeks. When the seedlings are about one inch tall, thin them to 6 inches apart.